Lens Clean. Liquid cleaner for optical surfaces. Lens Clean™ is distinctly prepared to safely remove finger prints and water or oil based contamination from optical surfaces without streaking. Lens Clean™ is NON-ALCOHOLIC solution. Most Lens cleaning solutions are alcohol based. Alcohol by itself is not suitable for remove stains or spots and may leave streaks behind. 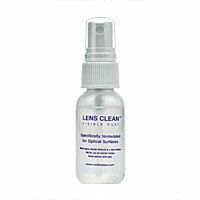 Use Lens Clean™ with VisibleDust micro-fiber Magic Cleaner or other lint-free cloth. This 30 ml size lens cleaner is conveniently portable.